As an aside – one of the great things about networking with other authors is that they often give you free ARCs (advanced reader copies) of their upcoming books to review. I’ll be looking for some ARC readers in late October for my novel, The Lone Wolf, due out in December. If you’re interested, please sign up for my mailing list (link on the left) for details. Author K.M. Weiland does a bit of everything – writing fantasy and speculative fiction, mentoring new writers, and blogging helpful tips about the writing process. 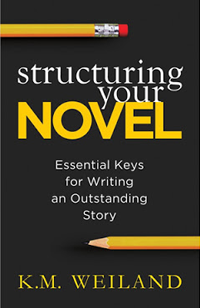 Her new book, Structuring Your Novel: Essential Keys for Writing an Outstanding Story, is a must-read for anyone writing a novel, no matter what stage she’s at in the process. The book is a companion to her Outlining Your Novel: Map Your Way to Success. Part one walks writers through the basic structure of a 3-act story, from writing a strong opening hook, setting the tone and defining the setting, to writing an ending that readers will love. Part two focuses on scene development. She delves into Randy Ingermanson‘s scene/sequel (action/reaction) idea, expanding on it with ideas for scene disasters, conflicts, dilemmas, and decisions, as well as variations that still work in the context of a structured scene. Part three is about structuring your sentence – about what makes prose good. This for me was the most helpful section and what I’d be most likely to refer to other writers. She covers participles and parallelism (a huge thing for me), run-ons and fragments, as well as how to get rid of stuff you don’t need, like modifiers and filter words. Throughout the book, Weiland gives detailed examples from movies and books, as well as coming back to the same four in every chapter: Pride and Prejudice, It’s a Wonderful Life, Ender’s Game, and Master and Commander: The Far Side of the World. It’s her examples that really make this book useful; it’s one thing to tell us about a concept, but much better to show us through real-life examples. Overall, this is probably one of the most helpful writing books I’ve read, and one I definitely want on my shelf. Day 7 of the Blogging from A to Z April challenge. Today’s topic: grammar. I love grammar. I could happily diagram sentences for hours. I love the rules, the order, the patterns. The exceptions, the similarities between English and other languages. “Martha Speaks.” Of course. He idolizes that show. Gleefully I told him about adverbs (“Inverbs,” he calls them). Adjectives. Nouns. Interjections. Conjunctions. If he keeps this up, he’ll know all about gerunds by the time he’s in kindergarten. As a grammar geek, I couldn’t be prouder. WAS IS NOT NECESSARILY PASSIVE!!!!!!!! This comes up so often that I feel the need to address it, because otherwise I might punch someone. Was, in and of itself, isn’t passive. Was can weaken your writing if overly used (just like anything that’s overly used), but just the sign of it doesn’t mean your sentence is passive. Passive is a grammatical term that means something was done to the subject. Bob was running. – not passive. Sue was knocked over by a pack of wild dingos. – passive. Why is the second passive and not the first? Because in the first, nothing is being done to Bob; Bob is the one doing the action. In the second, however, Sue is the grammatical subject, but she’s not doing the action; that’s the dingos (which are a prepositional phrase modifying the verb). Now, I’m not saying that “Bob was running” is a great sentence. But it’s not actually wrong, in some cases. Everyone knows about the three main tenses in English – past, present, and future (and if not, read this). But there are actually fourteen tenses. When talking we tend to use them well enough, but when it comes to writing it sometimes falls apart, especially if you’re critiquing and don’t know when each should be used. And that’s when the passive charge comes in. People see that was verb in there, specifically with the progressive tenses, and immediately think it’s wrong. I know all this because I had to teach it to high school kids, as well as know the correct verb forms in French and Russian (they’re similar but not exactly the same). If grammar makes your head swim, look it up. There are tons of great resources on the web. Or learn a foreign language. Volunteer to tutor students. But please, for the love of God, don’t assume that was is always passive and must be exorcised from your writing. I belong to a number of writing communities, each with their own pros and cons. One that I’ve joined has quite a few high school girls in love with Twilight as members. Each writes a story about love and vampires, then posts it and solicites feedback. Her friends flock to it and pour on the undeserved accolades, lauding it as the best thing ever written. Usually the writer will ask for feedback in the forums as well, and I’ll take up the challenge. The story, which I’m sure she intends to turn into a whole book if only she had the skill and attention span, is generally only 1000-1500 words, which doesn’t take long to read and critique. Depending on the talent and ability of the writer I’ll give a more nuanced, detailed evaluation, but many, with their myriad grammar mistakes, have far bigger issues to tackle before they’re at this stage. One thing that I often find a problem with is tense. Perhaps I’m hypersensitive to this because I taught grammar for a couple years, or maybe it’s my linguistics background (I speak bad French and worse Russian). Either way, this is something that sticks out to me and something that trips up readers. There are three tenses, generally speaking – past, present, and future. Past means it already happened – I went to the store. I was going to the store. Use past or past participle. This is the tense used for the majority of fiction works. Present means it’s happening now – I go to the store. I’m going to the store. Use present or present participle. This is used for some fiction works. Future means it’s going to happen – I will go to the store. I’ll be going to the store. Use future or future participle (is that even a tense?). This is stupid. Don’t write like this. Whether you choose to write in past or present is really up to you. In the novel I’m working on, The Lone Wolf, half the novel is shown through one POV in past tense, and the other half is another POV in present tense. Some people like it, and some people are confused as hell. I got up and walked down the stairs. I go outside. Man, it’s hot out! I wiped my face with my sleeve. Then I saw my friend. He’s working on his car. This makes me cry. There are two ways to fix it. See the difference? Yes, I’m sure you do. And you’re thinking that I’m an idiot for thinking you’re an idiot. Sorry about that. I have one final point while building on this, something I didn’t even realize I was doing wrong until it was pointed out to me, and something you’re probably making mistakes with too. Some pronouns and indefinite articles are always past tense, and some are always present. This and these are present; that and those are past. If you find this helpful, please let me know! And of course, even if you didn’t, any and all feedback is appreciated.